Soil is the medium that a gardener’s bounty hinges upon. Soil is comprised of organic matter, silt, sand and clay. The kind of soil a gardener has depends upon the percentage of clay and sand in the soil. If at least half of the soil is comprised of clay particles, the soil is “clay soil.” Clay soil poses several challenges to a gardener, including poor drainage, soil compaction, a typically high pH level and being difficult to work. Determine whether you have clay soil. Dig into your soil with your hands and pull up enough soil to fill your two hands. 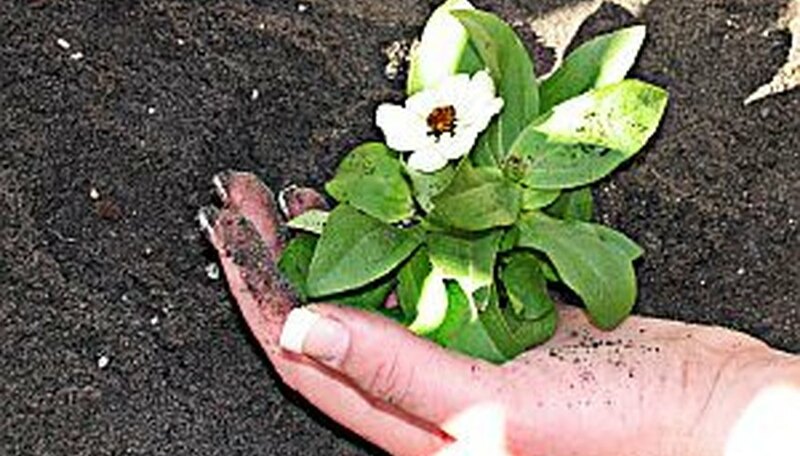 Squeeze the soil together in your hands as if you are making a snowball. If the soil forms a solidly compacted lump in your hands that sticks together easily, your soil has a high clay percentage. If the soil will not form a lump easily and crumbles instead, your soil has a high sand percentage. Prepare your garden beds for planting. Work the clay soil when it is not too wet because this will further compact the soil and the soil will be even more difficult to handle when it is saturated. Turn over the soil with a garden fork or a shovel to break up large chunks of soil. Break up these chunks with your garden tool as you turn the soil over. Allow the larger soil chunks to dry out in the air and sun until you can break them up more easily. After working the soil down to a depth of between 6 and 8 inches, rake the soil smooth. Consider determining the pH level of your soil so that you can take steps to improve your soil and neutralize it if it has a high pH level. Home testing kits are available for purchase at garden centers. Your local Extension Office may also offer soil testing services. If you find your soil to be alkaline (more common with clay soils), add sulfur to the soil prior to planting. A professional test result will usually provide you with guidelines for the recommended amount of sulfur. If you performed your own soil test, add sulfur to the soil carefully because you do not want to add too much. It will likely take over a year to reduce the pH significantly and more than one application of sulfur may be required. As a general example of sulfur amounts, a 600 square foot planting area would require approximately 40 pounds of sulfur to reduce the pH by approximately one point. If you test and find your soil to be acidic, adding lime to the soil prior to planting will neutralize a soil with a low pH level. As a general example for lime application, a slightly acidic clay growing area that is 600 square feet would require approximately 60 pounds of lime to raise the pH level one point. Add a 2-inch layer of sawdust or shredded bark and work this into the soil to improve the soil drainage. Add a similar layer of compost and incorporate this into the soil as well. Next, sprinkle the nitrogen fertilizer over the soil following the recommendations on the package for the amount for your growing area. Raising the nitrogen level of the clay soil will improve the soil for planting. Work the nitrogen into the soil adequately. Choose plants for your soil carefully. There are varieties of perennial plants that are better suited for clay soils than others are. Suggestions for planting in clay soils include canna lily, geranium, day lily, bleeding heart, astilbe and western columbine. Prepare the holes for planting. Create 8-inch-high hills in every spot that you will place a plant. Look at each plant carefully before you put it into the ground. Find the crown of the plant where the roots begin and measure from approximately 1 inch under the crown to the bottom of the roots. Make each hole exactly this depth so that the crowns will be above the soil level. Make each hole two times as wide as the roots and shape the planting holes like bowls that taper in toward the center at the bottom of the holes. Place the plants into the prepared holes, making sure that the crowns will be slightly above the soil surface. Discard approximately half of the clay soil removed from the hole and refill the hole with an equal mixture of clay soil and quality topsoil. Water plants growing in a clay soil when the soil does not feel damp. Insert your finger into the soil to determine if the soil needs water. Fertilize plants with the general fertilizer once or twice over the growing season, following the recommended measurements on the fertilizer package. Add fresh sawdust and compost every spring for several years to slowly improve the soil quality and help the soil to drain better.